What is it about lace doilies that makes them irresistible at thrift stores? All I know is that that: (1) vintage doilies are beautiful, (2) they’re abundant, and (3) they are full of project potential! 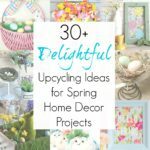 Whether you just display them as vintage decor…or use them to embellish something…or truly repurpose them, they are a favorite of mine- and I suspect, a favorite of many of you, as well. 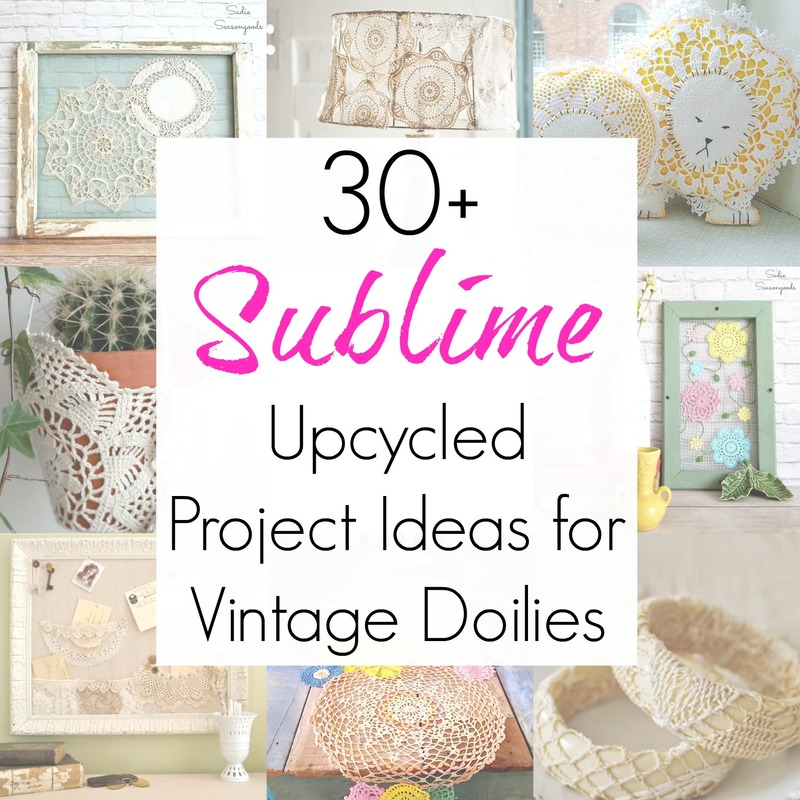 Both of these are super easy to make and a great way to display your favorite vintage doilies. 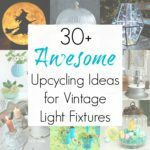 But I’m still drawn to them at thrift stores and antique stores, which means I need even MORE upcycling ideas! And if shabby chic decor or cottage decor isn’t your thing, lace doilies can be upcycled into holiday crafts, as well. 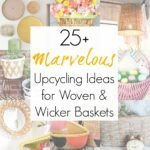 So, why not unpack Grandma’s doilies from the attic and breathe new life into them with one of these upcycling ideas? I’ve collected the best of the best to share with you and hopefully spark some creativity of your own! So many stunning ideas- which one is your favorite? Or conversely, have you upcycled crochet doilies into something else entirely that isn’t represented here? I’d love to hear about or see it in the comments below! I’m sure anyone else reading this might be curious as well! 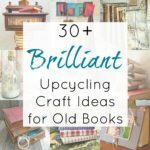 And if you’re just looking for upcycling ideas or repurposed craft projects in general, you can always scroll through my full collection here for even more inspiration. I love the lion pillows, the wrapped bracelets, and tablecloth….but my favorite just might have to be the clay impressions. How cool is that? My goodness, such wonderful ideas!! I have used some in a wall art project with embroidery and buttons, but your ideas will help me do something with more that I have. Thanks! Pinning!! 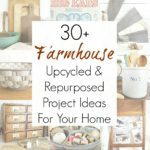 It was so fun gathering ideas for this round-up…they are all so fun! I love all these ideas, my favorites are the lion pillows (so creative) and the dream catchers! Those lion pillows SLAY me, they’re so cute!! I’m so glad!!! And yes, those lion pillows are the cutest things- I just love them. All beautiful ideas but the tablecloth won my heart! What a lovely idea. The doilies are gorgeous. Aren’t they though? I’m so glad you enjoyed this collection of ideas! Oh my gosh LOVE these ideas! So many great ideas! The tablecloth and the lions are my favorites! Thanks for sharing at Celebrate Your Story! The lion pillows are so stinkin cute! So many great ideas here and I’d love to embellish a tablecloth. Keep the ideas coming please! Vintage doilies are so feminine and pretty, it’s wonderful to see them being used in a variety of different ways. These are great ideas, thank you for the inspiration. Thank you so very much, Leanna! I love crafting with Doilies, I use the paper ones as stencils. Some great ideas here, I do especially like the doily impressioned plates. Fantastic roundup of doily projects. Lots of inspiration here. Thank you for sharing at Vintage Charm.